This lap quilt from my mother's collection is tea themed and very unusual. Quirky, I call it. I don't know who made it, but it doesn't look like my mother's work, so I assume that she found it at a yard sale in her community. The quilt features embroidery, crayon, and iron-on appliques. It's all about tea! The saying shown here says "You are the sugar in my tea. . .one lump or two". 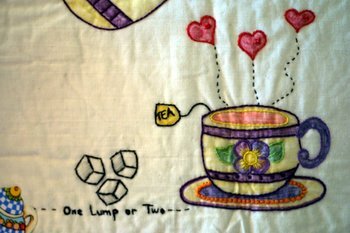 It's a fun quilt that can be used as a table topper or over a chair for a casual tea party. I love quirky quilts like that - its absolutely lovely.